I am not a breakfast person. Since I was a teen, most of my mornings involve a cup of tea and a queasy couple of hours trying to keep it all down. I know, its terrible! Breakfast is the most important meal of the day, but try telling that to my chronically upset stomach! Over the years I’ve developed ways of tricking my stomach into eating earlier. My favorite is to have “dessert” for breakfast. I don’t mean a bowl of ice cream or a slice of chocolate cake. 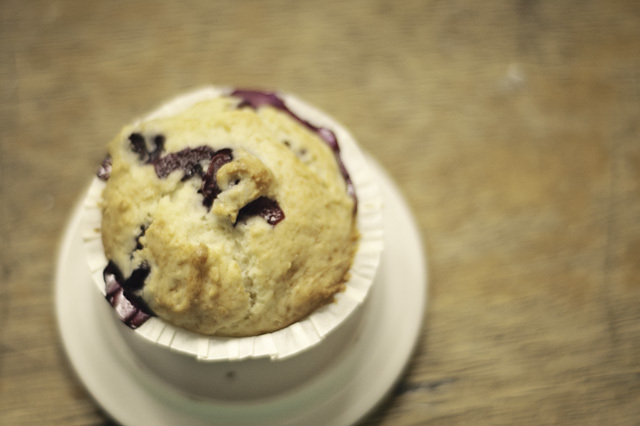 I’m talking more like these blueberry muffins made with Greek yogurt and fresh blueberries. Muffins have to be one of my favorite treats to bake. So versatile! You can make them sweet or savory just by changing up a few ingredients. I like to make a double batch and I wrap the extras individually in plastic wrap for easy to-go breakfasts, lunches and snacks. No one complains with muffins at least not in this house. The other day I found a tower of fresh blueberries on sale at the grocery store. I know, blueberries are totally out of season and these were from Chili so they were in no way local, but they were organic and 2 pints for $4.00. It’s January! How could I resist fresh blueberries at that price, even out of season. Anyway, as soon as I saw them I began envisioning the perfect blueberry muffin. Since I am no expert baker I took to the internet to find a good starter recipe. My requirements for a breakfast muffin usually include extra protein and less saturated fats and sugar. 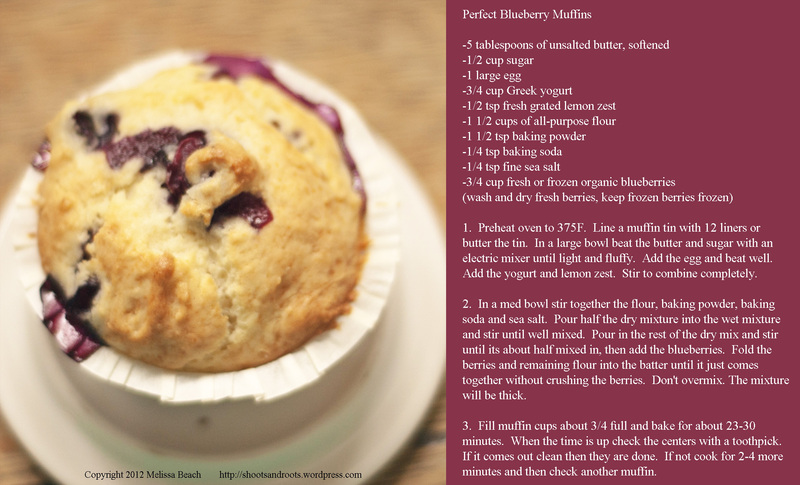 I quickly came across Kamran’s Perfect Blueberry Muffins post and agreed that they looked quite perfect. With just a couple minor changes I had a new breakfast muffin. I hope you enjoy them as well! Recipe originally from Cook’s Illustrated and Smitten Kitchen. Found via The Sophisticated Gourmet. 1. Preheat oven to 375F. Line a muffin tin with 12 liners or butter the tin. In a large bowl beat the butter and sugar with an electric mixer until light and fluffy. Add the egg and beat well. Add the yogurt and lemon zest. Stir to combine completely. 2. In a med bowl stir together the flour, baking powder, baking soda and sea salt. Pour half the dry mixture into the wet mixture and stir until well mixed. Pour in the rest of the dry mix and stir until it’s about half mixed in, then add the blueberries. 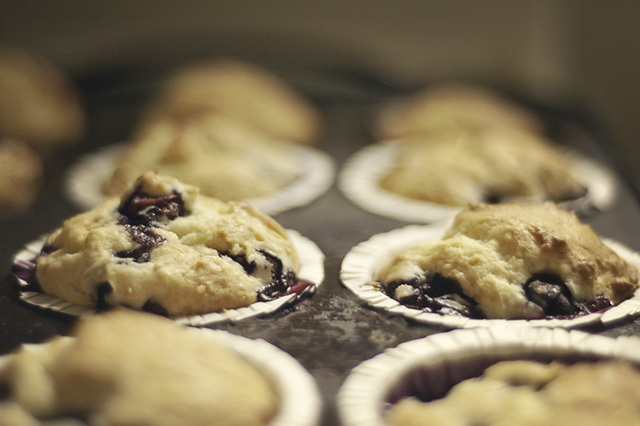 Fold the berries and remaining flour into the batter until it just comes together without crushing the berries. Don’t overmix. The mixture will be thick. 3. 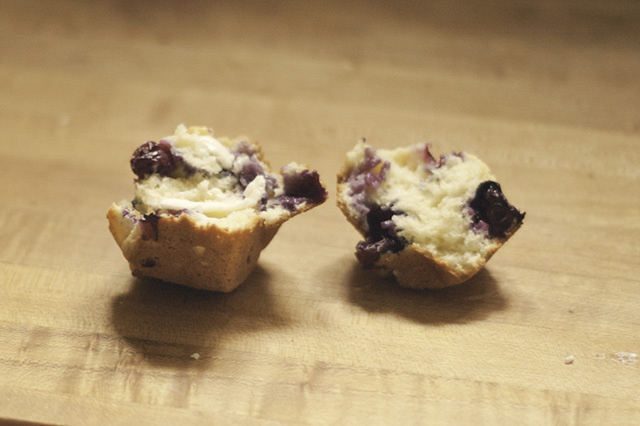 Fill muffin cups about 3/4 full and bake for about 23-30 minutes. When the time is up check the centers with a toothpick. If it comes out clean then they are done. If not cook for 2-4 more minutes and then check another muffin. These muffins look tender and moist. I love the idea of using Greek yogurt instead of a lot of butter or oil. Me too! The yogurt adds protein and tenderness without too much extra fat. Yes you did send me those! That was the last of them too. Thank you again. One of these days I will get another box out to you with lots of Sonoma goodies. Well, then….good thing I’m headed back to Northern Europe in June and can get you some more of those baking cups. 🙂 I have the feeling that Denmark is filled with treasure, just waiting to be discovered. We’ll see — I have been asking around lately about flea markets and thrift shops. So far, I’m hearing good things!